Markus Jones (Coxsackie-Athens CSD) accepts his diploma from his advisor Varada Vaughan, TVHS math teacher. Twenty-six members of the Tech Valley High School Class of 2017 graduated on Thursday, June 22 with lessons about the importance of consideration, compassion and creative thinking, and the value of their unique experiences at TVHS. 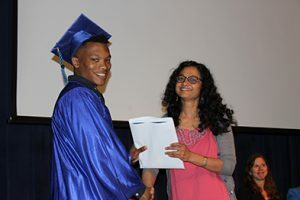 In her keynote address at the University at Albany Campus Center, TVHS math teacher Varada Vaughan told a story about a young woman’s difficult choices. Ultimately, the young woman thought out-of-the-box and with empathy to make a decision without hurting loved ones or adversaries. Vaughan urged the graduates to do the same throughout their lives. The class speakers were Nikita Losi (Wynantskill UFSD), who urged his peers to challenge themselves. Brandon Goddeau (Fonda-Fultonville CSD) talked about how special and unique TVHS is. Kira Fines-Kested (Greenville CSD) talked about the key lessons she learned at TVHS: Failure is a learning opportunity and is a part of success, the importance of never settling, and that it’s okay to ask for help. Ralph Accornero (Catskill CSD): Thank you for sharing your passion of cars and bringing new perspectives to the table. Jannatara Begum (Hudson CSD): Thank you for always being happy and having a smile on your face, no matter what the instance is. Your laugh is contagious and always makes my day. Arianna Burns (New Lebanon CSD): Thank you for your prestige baking skills! Your cakes are to die for, and you should definitely open up your own bakery shop. Austin Case (Greenville CSD): Thank you for always being of help when it comes to building or technology. Erik Clifford (Ichabod Crane CSD): Thank you for always caring about people and lending a helping hand when no one else will. Isabella Coleda (Schodack CSD): Thank you for your constant growth in yourself and academics. You’ve come such a long way and you deserve so much more than you think you do. Domonique Fiddemon (Troy CSD): Thank you for being a brilliant young woman. Your drive to learn is inspirational. Olivia Galasso (Cobleskill-Richmondville CSD): Thank you for always advocating for women’s rights. Your passion for helping others who don’t have equal opportunities is admirable. Brandon Goddeau (Fonda-Fultonville CSD): Thank you for your constant humor during serious situations. Sarah Hadley (Schodack CSD): Thank you for your artistic creativity and bringing projects to life. Sydney Hayes (Menands UFSD): Thank you for being very adventurous and always willing to try new things. Markus Jones (Coxsackie-Athens CSD): Thank you for being a great listener and giving great advice. You’ve impacted a lot of lives, including mine. Kira Fines-Kested (Greenville CSD): Thank you for being a hard worker and having constant motivation and determination. Keeley Kocsis (Averill Park CSD): Thank you for persevering during tough situations. You’ve come a very long way and I’m proud of you. Eddie LaRegina (Cairo-Durham CSD): Thank you for introducing us to new computer games. I never would have known what Slither was until you sent me the link. Nikita Losi (Wynantskill CSD): Thank you for your unique approach on controversial topics. Your banter makes me laugh and think outside of the box. Farzana Musomi (Hudson CSD): Thank you for being a great friend. You’re always there for me whenever I need someone and I appreciate you putting others before yourself. Andreea (Guilderland CSD): Thank you for your kindness and being a huge gift giver. You always helped people with their homework whenever they needed and we appreciate that. Jack O’Donnell (Guilderland CSD): Thank you for showing us that quiet people have loud voices. You’re funny and have a lot more to say than people think you do. James Piambino (Cobleskill-Richmondville CSD): Thank you for never letting go of your dreams no matter how many people try to knock you down. Samantha Pierce (Schoharie CSD): Thank you for your service to the community as a firefighter. Your willingness to serve helps create a better world. Darien Seifridsberger (Wynantskill UFSD): Thank you for your reliability and inquisitiveness. Kyle Sharpe (Cairo-Durham CSD): Thank you for always looking for ways to improve and having a good laugh. You’ve grown tremendously over the past few years, and we love your exuberant energy. Matt Smith (Greenville CSD): Thank you for sharing your political views with everyone and keeping us updated with the news. Cameron Smith (Wynantskill UFSD): Thank you for being able to talk to anyone in any situation and your love of music. I wouldn’t know anyone else to go to on advice for what song would be perfect for different situations. Khloe Thomas (Hoosick Falls CSD): Thank you for opening up and showing us who you are. Remarks were also offered by Principal James Niedermeier and Questar III BOCES District Superintendent Dr. Gladys Cruz.